Rembrandt Harmensz. 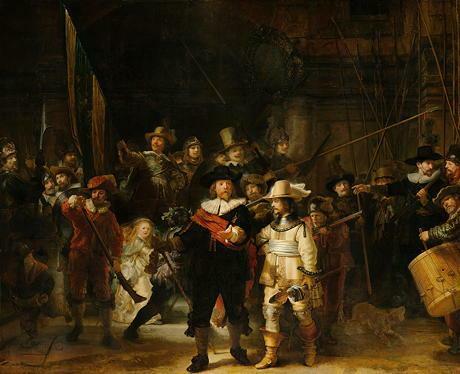 van Rijn, Militia Company of District II under the Command of Captain Frans Banninck Cocq, Known as the ‘Night Watch’, 1642. Rijksmuseum, Amsterdam. On loan from the City of Amsterdam. AMSTERDAM-ABU DHABI – There are 300 of them, in total. Don’t get confused with the war against the Persians, nor the heroic Spartans at Thermopylae. Here we don’t refer to soldiers, but rather to simple engravings, in ranks as closed as the Macedonian Phalanxes: these are the 300 prints from the Rijksmuseum, presented together for the first time. There are 22 paintings and 60 drawings as well. Nothing to be scoffed at: it was the least that could be done to celebrate the 350th anniversary of the death of one of the greatest painters in history. Who died in poverty, buried in a mass grave. His works are biblical, mythological or simply common, of men and women off the street. But they all demonstrate his ability to capture the human soul, making the artist a man of our times. Simultaneously, the Louvre Abu Dhabi inaugurates a rearranged version of the exhibition of the Golden Age presented in Paris two years ago. It combines treasures from the Leiden Collection of Thomas Kaplan (the greatest private collector of works by Rembrandt in the world), with those of the Louvre, and as a bonus slips in the painting the Abu Dhabi museum bought recently: Head f a young man with clasped hands , a work of maturity - circa 1650 -, much before destiny turned against the painter and hit him with the death of loved ones and financial constraints. • All the Rembrandts at the Rijksmuseum, from 15 February to 10 June 2019. • Rembrandt, Vermeer & the Dutch Golden Age: Masterpieces from The Leiden Collection and the Musée du Louvre at the Louvre Abu Dhabi, from 14 February to 18 May 2019. Beppe Ciardi, The Return of the Fishing Boats, circa 1920, Bologna-Milan, Bottegantica. CONEGLIANO – The Venetian vedutisti are of course Canaletto, Guardi, Bellotto, the famous trilogy from the XVIIIth century. But the residents of the Laguna were endlessly sketching its changing reflections, or the interior ones, that terraferma, between Palladian villas, rows of poplar trees and the Alps far-away summits. But here we have a true dynasty, active over the pivotal period between the second half of the XIXth and the first decades of the XXth centuries. Guglielmo, the father (1842-1917), a cousin of the Macchiaioli, sketched the Italian landscape in warm lights. His son Beppe (1875-1932) followed in his footsteps in a slight post-Impressionist manner. But it was the daughter Emma (1879-1933), a big traveller, who had the most remarkable paintbrush, inspired by Guardi, with thick impastos and saturated colors. • I Ciardi, paesaggi e giardini, at the palazzo Sarcinelli, from 16 February to 23 June 2019. PARIS – The Biennale of posters in Mexico and La Paz, the biennale of graphic arts in Cali, the Chakana biennale in Ecuador: graphic art has always been very popular in Latin America. Violent political events – since the Mexican revolution in 1910 to the numerous coups d’état – have been an endless list of opportunities for artists to express themselves in an immediate and visual manner. Graphic artist Michel Bouvet (who signed the identity of the Bicentennial of the Revolution and the Rencontres d’Arles) drew from his knowledge of the Latin-American world to offer a “best of”. The exhibition presents a combination of older artists, used to working with glue and scissors, like Colombian artist Martha Granados (born in 1943) or Brazilian Rico Lins (born in 1955), and younger ones, such as Cuban artist Idania del Rio, born in 1981, who know how to manipulate the codes conveyed by graffiti and the social media. • Fiesta gráfica at the Maison de l’Amérique latine, from 15 February to 7 May 2019. Jane Graverol, Le cortège d’Orphée, 1948, oil on canvas, 70 x 50 cm, Collection Fédération Wallonie-Bruxelles, photo Luc Schrobiltgen © SABAM Belgium 2019. MONS – The artist is often associated to deserted piazzas with shadows cast by wooden models, to the towers of the castle of Ferrara, and later to wild horses on the beach. In short, he is considered very Italian, but his influence went well beyond the peninsula: De Chirico, the inventor of metaphysical painting, marked the Belgian generation that followed him. There was Magritte, of course. But others included Paul Delvaux, the champion of stations and mirrors, and the iconoclastic Jane Graverol. They have all been brought together under the same label. • De Chirico, aux origines du surréalisme belge at the Beaux-Arts, from 16 February to 2 June 2019. This is a path similar to that of David Douglas Duncan, who happened to enter Picasso’s villa, la Californie, by chance, and became the biographer of his later years. Young Swiss Yves Debraine was at the right place – in front of the hotel Beau-Rivage in Lausanne – at the right moment -2 December 1952 – when Charlie Chaplin, who had become a persona non grata in the USA after marrying the very young Oona O’Neill, came to seek refuge in Europe. Debraine, who had already worked for Life magazine, recommended a restaurant and hit it off with the new arrivals. It was the beginning of an unexpected career that lasted twenty years. As the “official photographer”, he immortalized all outings to the circus, the autograph sessions, and produced Holiday and New Year’s cards until 1973, for the family that grew constantly, having had eight children between 1944 and 1962. These photographs have rarely been shown, except at the Fondation Gianadda in 1998. Here, classified by theme, they are the subject of an exhibition from 20 February to 5 April, at the Chaplin’s World at Corsier-sur-Vevey, at the Bran manor where the iconic couple settled. • Chaplin Personal, 1952-1973, by Yves Debraine, Les Editions Noir sur Blanc, 2019, 144 p., €29.